A corner of the Da Nang beach is seen in this file photo. Many coastal land plots in the central Vietnamese city of Da Nang have recently been sold to local people, but it turns out that foreigners, mostly the Chinese-speaking ones, are behind these purchases. Vietnam currently does not permit foreigners to make land use transfer transactions, and they are only allowed to own apartments or houses in 50 years, according to the new Law on housing that took effect on July 1 this year. Many Chinese nationals have thus provided money to Vietnamese people and had them acquire land plots along the beach in Da Nang on their behalf, according to the municipal Department of Natural Resources and Environment. 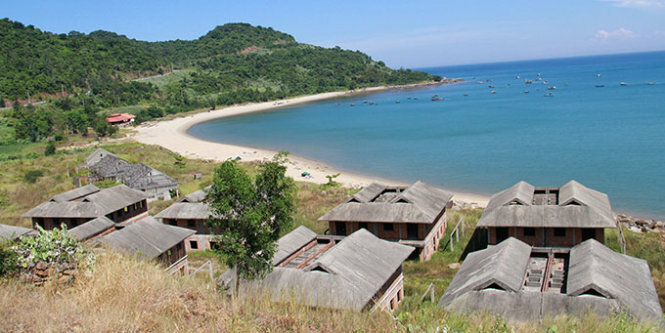 “Many land plots in coastal districts such as Son Tra and Ngu Hanh Son are sold to Vietnamese-run businesses, but behind them are foreigners,” department director Nguyen Dieu warned at a recent meeting with the city’s leaders. Tran Tho, secretary of the city’s Party Committee, acknowledged that the phenomenon is “very dangerous,” and asked relevant agencies to look into the case. Thirteen land plots in Ngu Hanh Son District have been sold to Vietnamese people suspected of buying them for foreigners. People have already begun building houses on these land plots and some seaside hotels and restaurants have hung banners in Chinese language next to the Vietnamese ones to attract guests, a visit by Tuoi Tre (Youth) newspaper finds. With foreigners currently not permitted to buy lands or houses, the act of acquiring land plots through Vietnamese people is in fact violation of the law, Nguyen Van Lan, a real-estate expert in Da Nang, told Tuoi Tre. However, it is not easy to stop the phenomenon or penalize the violators, as all documents regarding the transactions are under the name of the Vietnamese representatives. “Still, we have to remain cautious as foreign ownership of coastal land plots can affect the national defense and security,” lawyer Le Cao, from the FDVN law firm, warned. Cao suggested that authorities have a close watch on the business activities that will take place at the land plots acquired by foreigners. “We should know clearly what the real owners will do with the land,” he advised.